Update: Click here for an updated review (with more pictures) which happened a few years later plus I dug a little into the original version of this flavor. 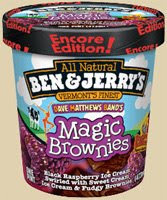 The full name is Ben & Jerry's Dave Matthews Band® Magic Brownies™ Encore Edition and I just had some. The description is Black Raspberry Ice Cream Swirled with Sweet Cream Ice Cream & Fudgy Brownies. I'll admit, my stomach is a bit off, so first scoop is gonna be quick: I only had about the top 1/2" of the container. In this small sampling, I discovered a nice black raspberry swirled with a nice sweet cream. I only got two brownie chunks with one more in site, but both were tasty and a respectable size. It's a fine ice cream, and simpler then black raspberry chip, but I think I'll stick with plain black raspberry. On Second Scoop: This is a nice cream. The brownies are kinda hard, but they still possess a fresh quality, even if it is hard to cut one in two pieces as you dig in. I'm also enjoying the ice cream itself. So, it's not knocking my socks off, but I am enjoying it. The original was better. They had some sort of raspberry syrup and rather than raspberry ice cream. A picture of the ice cream please.